The budget review presented is a surplus of $863K. It incorporates new items and changes not previously identified in the original budgeting process. Changes to the carry over projects post completion of the financial statements 2012/13 were also identified. There were also projects not identified as carry over projects which are now included as part of the request for funding at this review. Management have completed their review of the 2013/14 Budget. At a high level, the following table shows the change between the Original Budget 2013/14 and the current (First Quarter) budget review. The 2013/14 Budget has been reviewed to incorporate new items, changes not previously identified in the original budgeting process, and changes to the budget due to events arising since the adoption of the Original Budget 2013/14. The total result of the First Quarter Budget Review 2013/14 is a projected surplus of $863K. An analysis of the changes is provided below. ● Contribution from social services programs has been revised down to $0 (from $135k). This has caused financial impact on the Council’s bottom line. These programs had previously contributed to overheads such as cleaning, electricity, support services and general expenses such as office supplies. Due to changes to structure, these costs are now covered in different parts of Council. For example, cleaning is now covered under buildings and facilities. [CEO Note: The above item will be further reviewed with the Executive Team, and if changes can be accommodated through recovery of overheads, they will be resubmitted to Council in the next review]. ● Halls and sport facilities related costs increased by $33K. More detailed procedure implemented for cleaning and maintenance process. This increase relates to a funded program within the Department of Social Services, where the program grant is reduced and the funding therefore drawn from a reserve account. Explanation to capital revisions is outlined below. Regular reporting to the Council is necessary to inform business decisions. Management reports to the Council on the outcome of the First Quarter Budget Review also ensure appropriate approvals are in place. The attached Revised Budget Statements reflect the financial implications of the commentary above. The budget presented is a surplus of $863K. Council has recently received notification from the Hon. John McVeigh Minister for Agriculture, Fisheries and Forestry that Council can now adopt the Maranoa Regional Pest Management Plan by resolution in accordance with the Land protection (Pest and Stock Route Management) Act 2002. That Council adopt the Maranoa Regional Pest Management Plan as attached. At the general meeting of Council, held on 25 July 2012, the draft Maranoa Regional Pest Management Plan was approved for submission to the Minister of Agriculture Fisheries and Forestry. Council has recently had notification from the Hon John McVeigh MP, Minister for Agriculture, Fisheries and Forestry that Council can, by resolution, adopt the Plan in accordance with the Act. The Department has provided some suggestions that may be added when the Plan is next reviewed. Such suggestions will be implemented into the Plan prior to a review by the Regional Pest Management group meeting to be held prior to end of December 2013. Council has a legal liability in accordance with the Land Protection (Pest and Stock Route Management) Act 2002 to have an approved and adopted pest management plan for land under its jurisdiction. Should Council not have a plan, has a potential for political implications and Local Government non conformance. Identified in the operational budget for Rural Services, within the Environmental Health budget. Council has recently been advised that State Government have implemented repeal of State mandated cat registration. That Maranoa Regional Council will not continue registration of cats therefore will not be a ‘declared’ Council for such purpose. The newly introduced Agriculture and Forestry Legislation Amendment Bill 2013, introduced by Minister McVeigh in May and passed on 10 September 2013 received Assent on Monday 23 September 2013. Councils have 28 days (due on 21 October 2013) in which to resolve that they are a declared local government for the purposes of continuing cat registration. It is intended that despite the repeal of cat registration requirements under the Act, local governments will have the choice of enacting local laws requiring cat registration pursuant to the local law making power conferred under section 28 of the Local Government Act 2009. Maranoa Regional Council’s Local Law No. 2 (Animal Management) 2011 , allows for the registration of cats, Schedule 1 Prohibition on keeping animals, Column 1 Section 2 - Cat, Column 2 Circumstances in which keeping of animal or animals is prohibited (a) more than 2 cats over the age of 3 months on an allotment in a designated town area. (b) more than 1 cat over the age of 3 months on multi-residential premises. 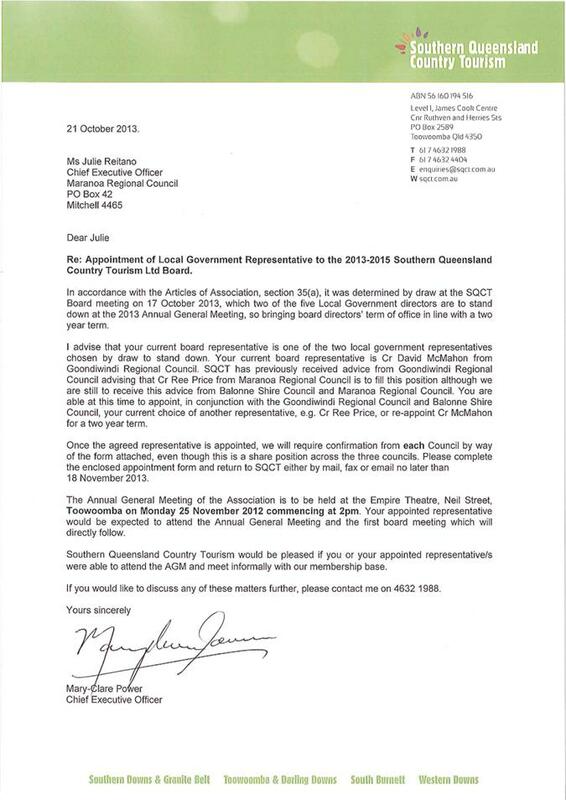 As the twenty eight day period falls prior to the next Council meeting, it is proposed that after discussions at Council’s workshop on Wednesday 16 October 2013, a letter be sent to the Minister’s office that it will not be a ‘declared’ Council in accordance with cat registrations, and further, that such option will be tabled at the next General Meeting of Council to be held on Wednesday 25 October 2013, for resolution by Council. Legal and Political – not advising Department Agriculture Fisheries and Forestry of being declared or not declared Council. Council has received applications (19) from landholders seeking to graze land within this Region. Applications have been for Reserves and various parts of the Stock Route network for cattle grazing purposes as fodder source become scarce on their own land. That Council advertise the identified relevant land located on its stock route network, seeking landholders to make application for agistment. Due to prevailing weather conditions experienced in this Region, Council has received applications (19) from landholders seeking to graze land within the Maranoa Region. At this time, Council has not advertised any land for grazing purposes however landholders are experiencing extreme conditions as fodder becomes scarce. Applications have been for Reserves and various parts of the stock route network for cattle grazing purposes as fodder source become depleted on their own land. The Minister for Department of Agriculture Fisheries and Forestry has drought declared part of the Maranoa Regional Council area – west of the Carnarvon Development Road from the southern end of the shire around to the west, north-west back to the northern side of the Roma to Taroom Road. The majority of the applications are located within the declared drought area. Those applications that are not located in this area, are being considered on an individual basis and may be granted grazing rights if the applicants property has been assessed as individually drought declared. Land Management Officer have completed inspections of appropriate land, to identify pasture quantity and condition, water availability, stock control and public safety requirements. Applications that depict areas identified as Primary or Secondary Routes in accordance with the Land Protection (Pest and Stock Route Management) Act 2002, have been declined at this time, as these areas are being preserved for travelling stock. The exception to this guide is when fodder has been assessed as being more than what is required to be reserved for travelling stock. It is expected there will be no legal and or financial risk, so long as the decision making process is aligned with Land Protection (Pest and Stock Route Management) Act 2002. It is expected that there will be no policy implications by implementing advertising. In Correspondence dated 18 October 2013, Commerce Roma requested Council’s support for the proposed Roma Christmas Tree Project. This cash and in-kind assistance will help to facilitate the purchase, installation, removal and subsequent storage of the Christmas tree. In addition to this assistance, Commerce Roma has also requested public liability coverage for the period that the tree is on display. A. Approve financial assistance totalling $6600 ($5000 cash & $1600 in-kind) for the Roma Christmas Tree project. B. Investigate a suitable location for the tree (subject to consultation with Commerce Roma). D. Recommend that Commerce Roma arranges its own public liability insurance to cover any activities that are outside of the scope of installation & removal (if applicable). · Renewing enthusiasm and support for local businesses. It is proposed that the tree is to be located in the empty garden bed outside the National Australia Bank branch on the corner of Hawthorne and McDowall streets. It has been stated that the final location is subject to additional research and consultation. Council’s public liability insurance policy covers Council for negligence directly resulting from its activities. If Council staff installs the tree our insurance policy will cover any damages that may be directly linked to its installation. Council’s insurance policy does not cover damages that may result from interference by external members. The only garden bed in the vicinity of a power box is located on the corner of McDowall and Arthur Streets, outside the chemist. This power box is owned by the Easter in the Country Committee and its use would be subject to their approval. No power is available at the proposed site, outside the NAB branch on McDowall St. The author has requested a works quotation from Ergon Energy for the installation of a power box in this location (ref: 841914). At the time of writing it is unknown what the financial ramifications would result however, this project would involve underground works and therefore significant expenditure. The applicant suggested that a portable generator may alleviate the concerns as stated above. Council’s Manager – Environmental Health informed the author that a generator cannot be run in the street/footpath on a semi-permanent basis due to noise and emissions pollution. Council’s Coordinator – Parks and Gardens, has received plants to fill the vacant garden beds in McDowall St. An endorsement to place the Christmas tree in one of the McDowall St garden beds would conflict with the Parks & Gardens Unit’s work plan. The installation of a Christmas tree in McDowall or Arthur Streets would impact the hedges currently located in the garden beds. The tree is approximately 2.5m in diameter with a clearance height of 5-10cm. The hedges/undergrowth in these garden beds would need to be removed to permit the placement of a Christmas tree. It has been suggested that the tree could be located in All-Saints Parish land on corner of McDowall & Quintin St. Although this site is removed from the central business district, it is an alternative (potential) location for the Christmas tree(subject to All-Saints approval). Council would be required to reimburse the parish for electrical costs associated with the Christmas tree lighting. Due to the urgency surrounding the purchase of the Christmas Tree, and at the specific request of Commerce Roma Executive Officer, this matter has been presented to Council for consideration at its meeting of 22 October 2013. 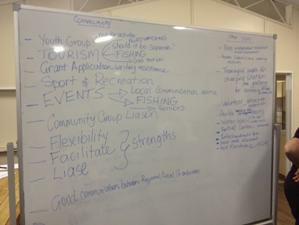 Had time been more available, Council may have encouraged Commerce Roma to apply for a Community Grant, as a more effective way of empowering the community to self determine. If Council was to endorse this proposal it is reasonable to expect similar requests from other regional towns. The tree that has been quoted within Commerce Roma’s proposal is a one-off second hand tree. MRC has requested a quote for additional supply of Christmas trees for regional towns, amounting to $4900 per tree (excluding transportation, installation and removal fees). If this project was adopted on a regional basis expenditure would exceed $30,000. To be redistributed from existing items in the Economic Development budget (potentially the regional business register). In correspondence dated 21 October 2013, The Western Star has requested Council support for their Gift of Giving Campaign. The requested insurance coverage, festive lighting and road closure would enable the Lions Club to hold its annual Christmas Carnival in McDowall St. This project is complementary to Commerce Roma’s proposal to purchase a Christmas tree for the McDowall St precinct as both projects aim to create a festive atmosphere and increase local business patronage. A. Provide in-kind support for the proposed McDowall St closure – 6pm to 9pm Thursday 5 December 2013. B. Cover electricity costs associated with the operation of the festive lighting. D. Recommend that The Western Star and/or Lions Club arrange their own public liability insurance to cover any activities that are outside of the scope of the road closure (as applicable). Council received correspondence from The Western Star on 21 Oct 2013 relating to their request for Council’s support of the upcoming Christmas events. The Gift of Giving campaign and Lions Christmas Carnival complement Commerce Roma’s Christmas tree proposal as all projects aim to create a festive atmosphere in Roma. Council’s Maintenance Supervisor has advised the author that the over-head festive lighting is a permanent fixture in McDowall St. MRC’s financial liability with regards to the lighting request would be limited to electricity expenses. Council’s public liability insurance policy covers Council for negligence that directly results from its activities. Insurance coverage applies to damages that directly result from the conduct of the road closure and/or Council infrastructure. Council’s insurance policy does not cover damages that may result from other activities (the street carnival) and/or interference by external members. It is recommended that The Western Star and Lions Club secure additional insurance to cover any additional activities that are outside of the road closure scope. Road closure - approximately $2500. Expenses related to festive lighting (one month duration) is estimated to be less than $1000. Council has been approached to sponsor costs associated with meals for participants attending a practical course in effective living. 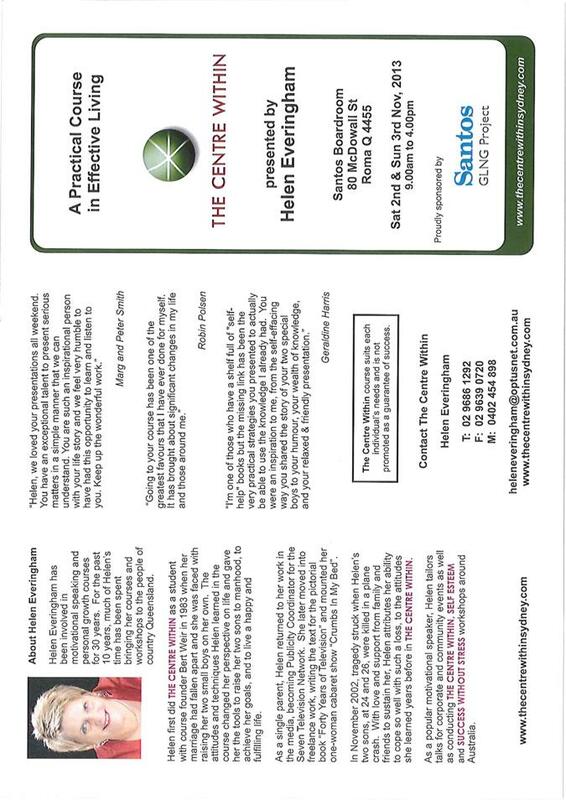 The Course titled “The Centre Within” will be presented by Helen Everingham on 2 – 3 November 2013 in Roma. That Council consider the request to sponsor the event, including associated requested costs. Puddy Chandler & Susie Ferrier have arranged for a personal development course to be held in Roma on 2 – 3 November 2013 at the Santos Boardroom, 80 McDowall Street Roma. The 2 day course is open to all residents, and will be delivered by motivational speaker Helen Everingham. The personal development course “The Centre Within” provides attendees practical and inspirational tools to help people achieve personal goals, and live a happy and fulfilling life. Helen visited the region a few years ago as part of the “Tie up the Black Dog Forum” in Roma, a forum focused on assisting those who suffer, or know someone suffering, from Depression and Bipolar Disorders. SANTOS GLNG Project is sponsoring the event by way of contributing funds towards the registration costs, enabling participants to attend the course at a cost of $150 per person, rather than the regular cost of $390 per person. It has been requested that Council consider sponsoring the meal costs for attendees to the value of $750 (This figure is based on 30 participants attending at $12 per head for the two days - Lunch). A verbal quotation has been obtained from the Royal Hotel for catering arrangements. The additional $30 requested is to cover the costs to supply morning & afternoon tea. Sponsors will receive public recognition for their contribution, both at the event, and as part of any post media articles produced. A copy of the registration brochure and received request is attached for Councillors’ review. Sponsorship of the event provides Council an opportunity to support community education and well being. The request does not meet the guidelines under Council’s Community Grants Program Guide. 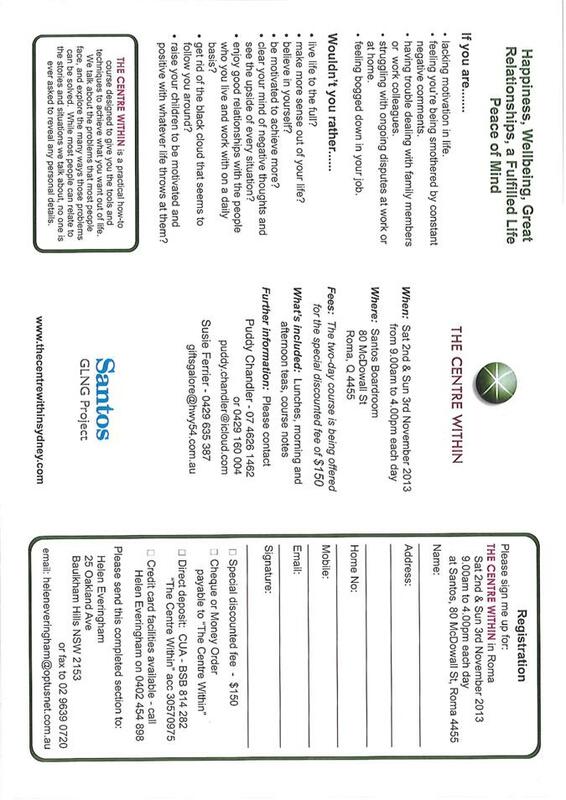 $750 for contribution to lunch & morning tea costs for the 2 day course. The requested amount can be accommodated if approved under the 2013/14 Budget. 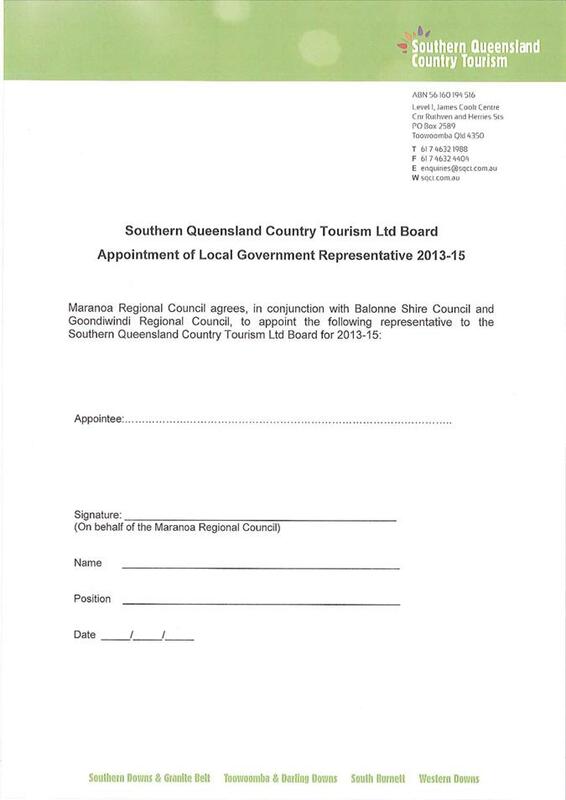 The articles of association of Southern Queensland Country Tourism Ltd affirm that five local government representatives will be appointed to the board of directors. At each subsequent Annual General Meeting it is decided by ballot which two will stand down to make way for other member Councils. Cr David McMahon of Goondiwindi Regional Council has stood down, and it has been informally agreed by Balonne and Goondiwindi Regional Councils that Cr Price will replace him for the period 2013 to 2015. Council’s formal nomination for Cr Price is now requested. 2. 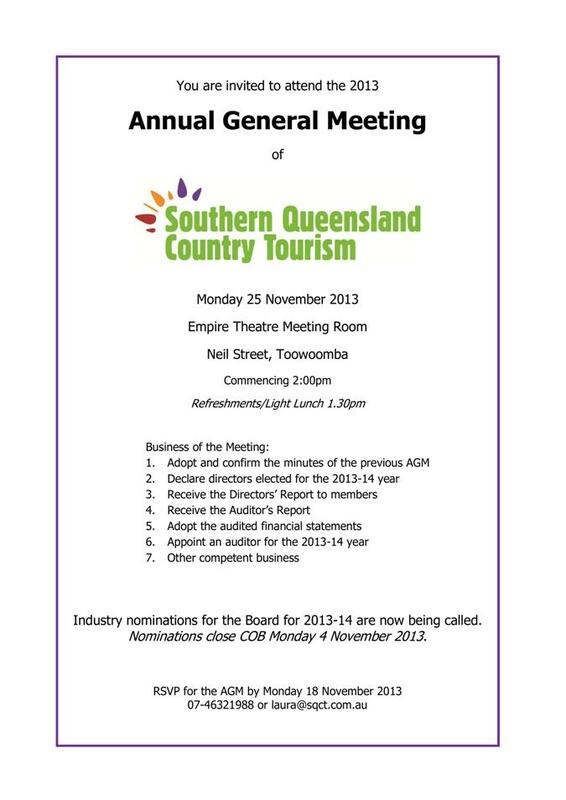 Authorise Council’s Chief Executive Officer to submit a nomination to the SQCT Annual General Meeting prior to 18 November 2013. Details of expenses associated with board membership have not been determined at this time. A report was tabled for Council’s consideration at its meeting on 25 September 2013. The proposals were considered, and a significant staff engagement / consultation process was undertaken. In parallel, a community meeting with Surat residents was attended with Councillors, to seek input into the shaping of the proposed replacement role for Surat. 4. Undertake community engagement with the Injune community with respect to their priorities for the Local Development Officer - Injune. 6. Approve the advertising for the additional position titled Associate to the CEO, and that the budget be amended prior to appointment. Council considered a number of matters raised for discussion at its meeting of 25 September. Extensive staff engagement / consultation with affected team members has occurred, as well as consultation with the Surat community (with respect to Community Development). A summary of the consultation outcomes, together with any changes (resulting from the consultation process) is outlined below. The recruitment process is continuing on this basis, and there have been no additional areas of concern raised. It is proposed to split/allocate Specialists, Managers and Coordinators between the Office of the CEO and the new Director on the following basis. * Of particular note in the table is the recognition of Cemeteries Administration as a separate function under Administration & Information Services. Under new processes being rolled out internally, the steps are significantly streamlined by ensuring that less people are involved. This will increase the consistency and quality of the service provided by Council to families who have lost loved ones. Under the new arrangements, the Manager will follow the process from the initial application through to burial. 2. & 3. Transitioning to a single Manager Community Services. There was some disappointment amongst the team members to be losing the current manager when her contract finishes. However, overall the team was supportive and excited at the opportunity to blend economic and community development. An appreciation of the changing scope of Social Services is now shared amongst the team. Still Recommended (As Originally Endorsed by Council). The reporting structure has been changed (Specialist reporting to Manager), and the Attorney-General's Department has been advised of Council’s plans not to retender. 6. & 7. Rural Housing Service Centre (RHSC) and the New Era of Community Care. Information noted - workshop briefing provided to Council for Community Care. No further action required at this time. (a) The loss of the title ‘coordinator’ and concern that this was a ‘demotion’ and might impact salaries etc. In the case of Coordinator, the aim is to limit use of this title to positions who are Work Unit/Team Leaders – responsible for a distinct function within Council. (b) The separation of Arts & Culture, and Sport & Recreation from Community Development. The team sees each of these functions as part of the broader term of Community Development. Whilst there was some appreciation for the Community & Customer Services’ aspects of Council’s libraries, the team saw Arts & Culture and Sport & Recreation as predominantly a Community Development function also. It did however again reinforce the confusion resulting from a mix of Regional Coordinators (for functions like Arts & Culture and Sport & Recreation) and Local Community Development Coordinators. (c) Concerns about the potential inclusion of additional functions under Tourism, when the position has only recently been recruited. The final recommendation to Council addresses this particular aspect, by recruiting for a new Work Unit leader/Coordinator based on the requirements of the restructured role. Funding will be available, given that the Manager position is not being replaced. - Flexibility to adapt to the community’s needs as they may change over time. The general feel from the community was that the person needs to be passionate about helping communities. Whilst it was recognised that the successful applicant can’t be required to live in a particular town, this was identified as the ideal scenario, so that the person could become part of the community. In listening to the teams and the community representatives, and in line with one of our goals for this term of Council, we want to get the balance right between regional coordination and local delivery, and get clarity of the roles between each. 1. Economic & Community Development will be part of the same Directorate as Facilities. This will strengthen organisational relationships between the two areas (e.g. Regional Sport & Recreation needs to work closely with the Facilities Department with regard to leases and management agreements). 2. The current Manager Facilities has qualifications in Community Development so this will provide an additional, valued set of skills that the Director will be able to draw from – particularly in relation to the linkages between Facilities and Community Development. 3. In the smaller towns, it is recognised that a specialist resource for each of the areas is not an affordable option. However, this model gives each of the front-line resources (Local Development Officers) access to specialist / additional support and assistance. 4. In the smaller towns, this will remove the ‘demarcation’ between Directorates and Departments, and enable the officer to work across all Development areas depending on the need at the time. 5. The model embraces the broader view of ‘development’ – i.e. not just about bricks and mortar, but also what it means to create livable communities – where people want to live and visit. 6. The model is cost effective as it has a Coordinator that ‘coordinates’ the activities of the 5 officer team. It also retains the concept of 5 officers, as it is a resource that Council and each of the communities values. 7. Accountability is clear – as there is no longer a ‘floating’ lead responsibility depending on the activity. With the Work Program structure in place, it will ensure that there is clear responsibility for implementation of tasks for regional coordination and local service delivery; and provide clear reporting lines. One of the other interesting points that came out of the Surat consultation is the value placed on the community newsletter previously coordinated by Nicola. This is a perfect opportunity for each of the Local Development Officers to drive the local e-bulletin development, and work with the Corporate Communications team to source information from other Departments about projects and activities happening in the local area. This will provide the Development Officers with access to the status of key projects of importance to the community. In the previous report it was noted that there are 2 vacancies at present. Now that the consultation is significantly progressed, it is a firm recommendation that all 5 positions be retained in the structure and that recruitment commence immediately for the vacant Surat position. It is proposed that the same consultation process be undertaken for Injune prior to that recruitment commencing so that Council can seek input on the community’s priorities for the position. The model as presented removes the previous anomalies where 5 individual coordinators, each pursuing consistent goals were reporting to a Manager, rather than functioning as a Work Unit/Team. The model as presented provides for a single manager under the Director Corporate, Community & Commercial Services. The service/program provision aspects currently ‘titled’ Social Services, will be renamed Community Services (e.g. Community Care, Community Support etc). The Development functions will be merged with Economic Development (i.e. Economic & Community Development). It is the intention that hosted and travelling events will still form part of Arts & Culture coordination. Council events will be delivered locally, but coordinated regionally where there is a risk of duplication of effort. For instance, we do not want to return to the days when 5 different advertisements were included in the paper for Australia Day. The overall coordination responsibility will rest with one person, but each of the local officers will be accountable for their part in the process. The transfer of civic events to this area was generally welcomed. The Executive Services area will contribute information – e.g. guest lists. As they’ve identified there will be some work to do to clarify roles and responsibilities, but these are not significant issues. By having all events in a centralised area, it is hoped that Council will be able to progressively develop an Events Management Plan that can be finetuned over time. It will provide the basis for continuous improvement, and irrespective of staff movements, the corporate knowledge will be retained. A summary of the structure is included on the next page. Coordination role included in Director’s role. ** Included in the table, is the formal inclusion of Local Disaster Coordination in Rob Hayward’s role. This had originally intended to be a temporary arrangement, but given the change in structure, Rob has indicated a willingness to have this included as a permanent commitment. 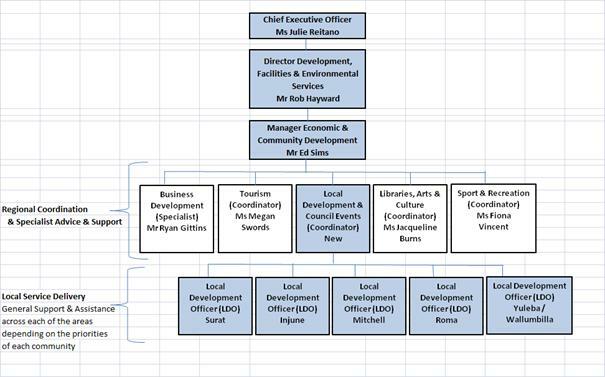 The report presents Council with a proposed amended Organisational Structure covering the top 4 levels. The report contemplates one additional position initially (Associate to the CEO) – it is envisaged that the position will be equivalent to a Coordinator level. The budget amendment will be processed through Council prior to appointment. Further investigation is underway for the support requirements of the much larger Corporate, Community & Commercial Services Directorate. This will be separately tabled for consideration at a future meeting.